Form 15G and Form 15H are used for avoidance of the TDS deduction on interest earned during the financial year on fixed deposits in Banks. Below is the explanation as to how it works. Suppose you have invested in FD in some bank worth Rs 5 lacs on interest rate @ 9.5 %, You will earn yearly interest 47500 Rs/-. If we consider that you don’t have any other income than this interest income is tax free as it is below tax slab limit, but bank will deduct TDS @10 % and pay Rs. 4750 to government as Income Tax and at year end bank will issue TDS certificate to you. Than you have to file income tax return and wait for refund amount. Note: – This form has to be submitted every year means if you have place FD for 3 year than you have to furnish every year fresh 15 G/15 H to bank. In order to avoid this lengthy process, you have to declare that you have not any taxable income. The main and only purpose of these forms is to submit declaration in writing in duplicate that there is not tax payable on his total income. In this case the payer shall not deduct any tax at source. So, if your annual income is not taxable as per current slab of income tax you are requested to file this form to respective bank where you have taken this FD. These self-declaration form are 15 G & 15 H.
Difference between form 15 G & 15 H is 15 G is for individual below 65 years of age & 15 H if for individual above 65 years of age. Another difference is that Form 15H can not be submitted by HUF’s. This form is to be submitted before end of financial year or first payment of interest whichever is earlier. A sample of both the type of forms can be downloaded from the links provided below. Most common question arises in everybody’s mind is that how to fill this form as this form does not contain any specific column like FD details etc. In order to help you we have also place filled 15 G form in word format. Details to be filled up by individual is highlighted by yellow color text. 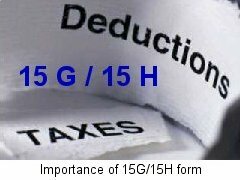 Conclusion: – One should submit 15 G/15 H form in order to avoid TDS deduction on interest earned during the financial year, if total income for that financial year is not exceeding taxable limit. How to Avoid TDS on FD? « Why gold is shining more? Nice post. I learn anything more challenging in different blogs everyday. It will always be stimulating to learn to read content off their writers and practice a little something there. I’d choose to use some with the content on my blog whether or not you don’t brain. Natually I’ll supply you with a link for your web blog. Thanks for giving.